This book is an attempt at a rational reconstruction of the fundamental principles of Indian Musicology and tries to indicate how the basic aesthetic appeal of the Ragas could be best interpreted. Challenging the idea that Indian music is a closed orthodox set of so-called rigid rules and principles, it treats Indian music as rooted in man's spiritual vision. Music unfolds this vision spontaneously thought proportionate note-sequences and it is the unending pilgrimage of man which opens richer and greater horizons where man can find his home to be a hermitage of abiding peace and blissful joy. Throughout the book there runs a single thread, namely, the transcendental dimension of the spiritual vision in aesthetic enjoyment, as reflected in the musical creativity of India, from the ancient period. The criticism of the so-called gharana system together with a criticism of the traditional tala system and other allied issues regarding the concepts of raga and rasa will be helpful to the scholars and researchers in this field. The distinctive feature of this book is the treatment of the revolutionary experiments of Rabindranath Tagore on Indian music and its musicology. This section will stimulate specialists and general readers alike. This book is a must for western readers. Born on January 1, 1934, Pradip Kumar Sengupta M.A., P.R.S., Ph.D. is the seniormost Professor in the Faculty of Humanities and Social Sciences (Vidya Bhavana) of Visva Bharati University, Santiniketan, West Bengal, India. He is at present working in the Department of Philosophy and Religion, Visva Bharati. Professor Sengupta has been the Dean of the Faculty of Humanities and Social Sciences (Adhyaksha, Vidya Bhavana) during 1984-86 and the Head of the Department of Philosophy and Religion during 1982-85. He was appointed National Lecturer by the University Grants Commission during 1984-85. He was a member of the Institute Board of Sangeet Bhavana (Faculty of Music) and also of Siksha Bhavana (Faculty of Science), Visva Bharati. He was associated with the University of Oxford and the London School of Economics for higher research in the year 1971. With the Department of Instrumental Music, Rabindra Bharati University, Calcutta and with Sangeet Bhavana, Visva Bharati, Professor Sengupta has been associated for a long time in various administrative and academic capacities. He has lectured at different national level seminars organized by Indian Universities and Research Institures. Apart from his professional expertise in Logic and Philosophy of Science, he has done intensive research in Musicology and is actively engaged in supervising doctoral research in visual art and in music at Visva Bharati. His other publications include: An Introduction to Philosophy (Progressive Publishers, Calcutta, 1966); Demonstration and Logical Truth (Academic Publishers Calcutta, 1968); The Logical Structure of Science (Centre of Advanced Study, Visva Bharati, 1970); Anumiti Pariksha (Scientific Book Agency, Calcutta, 1978). This book is not a study of the history of the musical heritage of India; nor is it a study of the chronological development of Indian musicology. 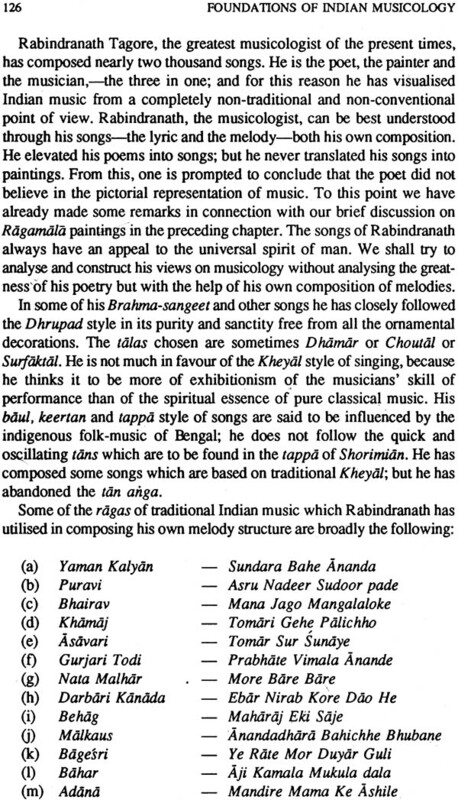 It is a humble attempt at exploring some issues which may be regarded as constituting the foundations of Indian musicology. In this attempt I have tried to develop the philosophy co-cultural and no theistic religious presuppositions of ancient Indian music and their influence on the subsequent stages of its growth. 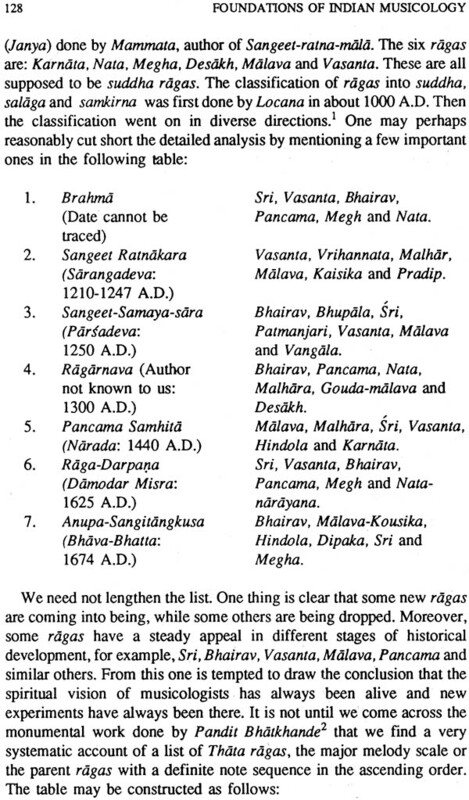 The unavailability of the original sources of Indian musicology makes the task immensely difficult; still it appears to be worth pursuing because a constructive attempt on the basis of conceptual analysis may be of some help, however little, for us to understand the continuity of the running thread of music, the richest and perhaps the oldest tradition of the most illuminating art of India. Indian music is said to be the enviable precious treasure of Indian culture. An assimilation of Aryan and non—Aryan cultures on the one hand and on the other of Hindu, Muslim, Indo—Iranian and Persian cultures, Indian music has grown into a full—bloom lotus which, still today, continues in its own glory emanating its ineffable ethos triumphantly conquering thousands of millions of souls in all corners of the world. The phrase ‘Indian music’ is used here in the sense of ‘Classical Indian music’ (as prevalent in North India), the nearest English equivalent of Marga Sangeet as distinguished from Desi Sangeet, a terminology used by Matangamuni in his Brhaddesi. 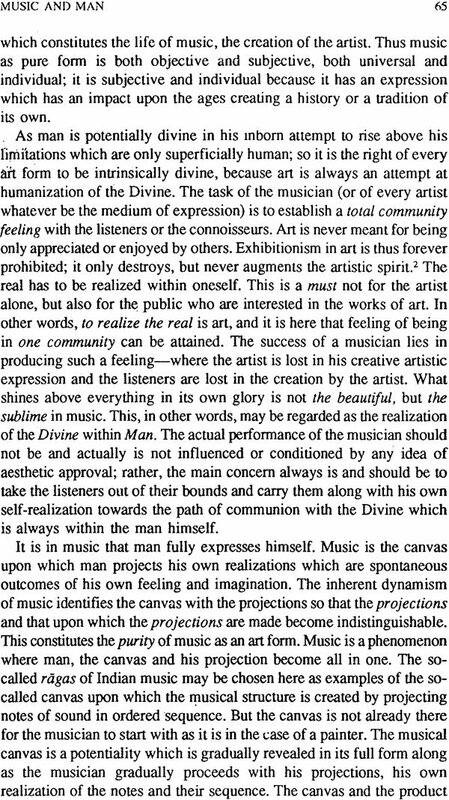 Attempts have been made to establish that it is the spiritual vision of man, either the inner gift a man is fortunately born with or the gift attained by man through deep meditation or through ceaseless cultivation of the so-called hidden treasures of music, that brings out the musician in man. Utmost care has been taken, with what success I do not know, to interpret the fundamental principles of Indian musicology by keeping it away from its mythological orientations. A closer study of Indian musicology would perhaps reveal the fact that either it has been overdone in the direction of deification or it has been underdone in the direction of being too cryptic. The result is that to most of the scholars it appears to be rather obscure and to some extent confusing. It is for this reason that musicology is fast losing its interest to the researchers who suffer from some sort of aversion to a serious study of this vast and important subject. This is one of the drawbacks for which musicology is not pursued as seriously as it should have been in Indian Universities. This book, however, is not meant to compensate this drawback; but researchers in this Held may find some debatable and controversial issues worth further probing into. We have tried to establish how the magical powers of musical notes in the hands of Indian musicians of dedication can do miracles in bringing man closer to each other and ultimately to the threshold of the Transcendent Eternal. 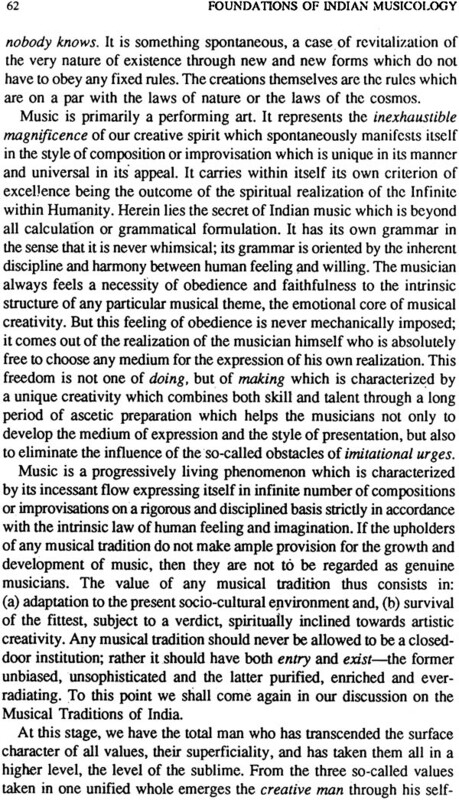 But at the same time the book also denounces the utility of deification of Indian ragas because this will only undermine the supreme power of musical creativity. It is rather a snag which has to be crossed over in order to realise the proper significance of Indian music. Indian music has never been a stereotyped system of closed orthodox ideas and rules. It has already grown with new and new experiments in all the important stages of history. In this book I have tried to place the focus on the fundamental rules and conventions together with a rational interpretation of the Raga system of Indian music and its aesthetic appeal with the hope that it might help the scholars and researchers to understand the subject in its proper perspective. There is also an added hope that it might go someway in unfolding the simple religion of spiritual vision where all human beings are alike irrespective of their caste and creed. This is, however, the inner secret which the music of India has particularly placed its focus on. Indian music thus may be said to be rooted in man’s spiritual culture. I regret that due attention could not be given to South Indian Music in all its details; some relevant references indeed are taken into consideration. The views of Western thinkers on religion, culture and music or other forms of Art have been discussed incidentally either as parallels or as contraries in so far as they are helpful in working out the main thesis of this book. Chapter one deals with the essence of religion and culture which constitutes the chief foundation of all arts. 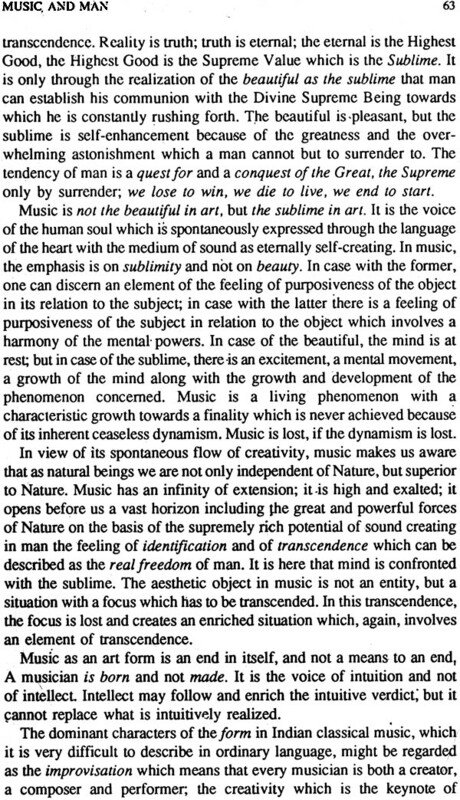 In Indian context it is said to be the basis, the fountainhead of pure music in its formative stage. The same fountainhead is said to nourish Indian Music at all subsequent stages. Chapter Two deals with the various branches of Visual and Performing Art. 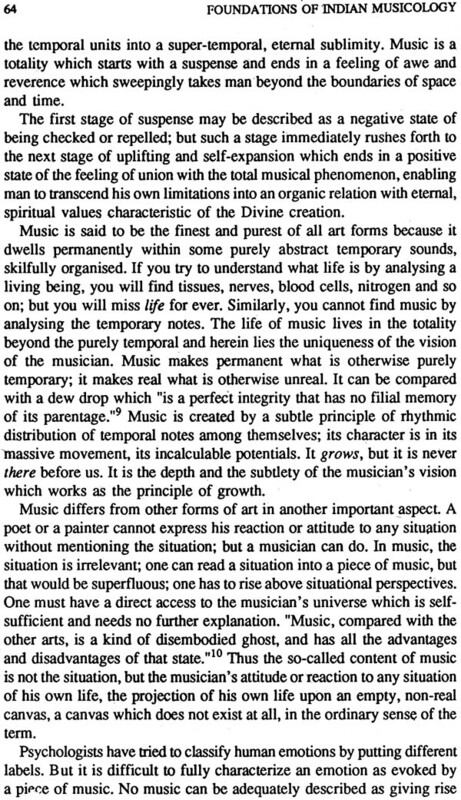 Chapter Three deals with the phenomenon of Music which is further developed into the fundamental relation between Man and Music in Chapter Four. Chapter Five is a critical treatment of the gharana system of Indian Music which is followed by an equally critical treatment of its Tala system in Chapter Six. 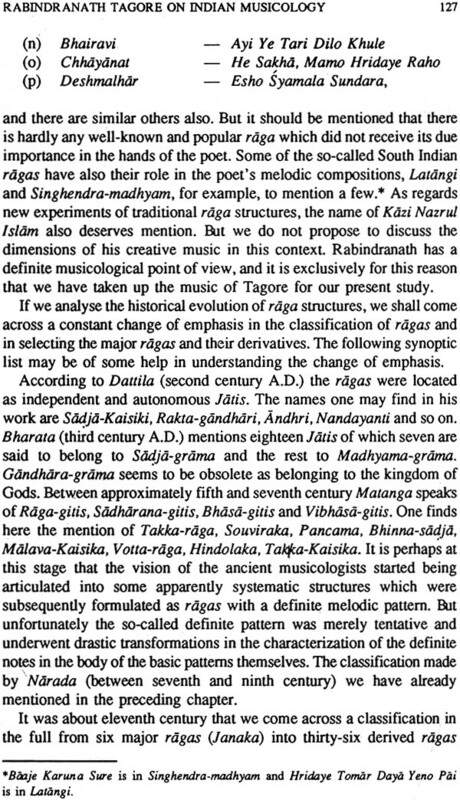 Chapter Seven embodies a critical analysis of the Raga system of Indian Music together with its aesthetic appeal (Rasa). 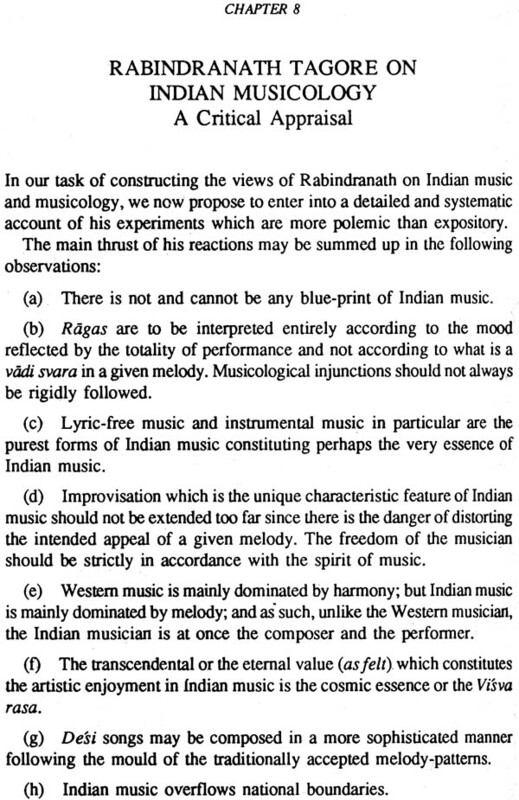 Chapter Eight is a constructive interpretation of the experiments of Rabindranath on Indian Musicology. I remain ever grateful to Dr. Kapila Vatsyayan, Secretary, Indira Gandhi National Centre for Arts, New Delhi who took great interest in this work and made all arrangements for its publication. I had the rare fortune of being intimately associated with Late Pandit Nikhil Banerjee, the great Sitar Maestro of the present times, from our boyhood days. It was he who initiated me in music and musicology. He is no more with us to receive my gratitude on the occasion of the publication of this book. May I, therefore, take the opportunity in dedicating this book to his loving memories as a mark of respect to the departed soul. I must acknowledge my indebtedness to Pandit Jnan Prakash Ghosh of the Sangeet Research Academy, Calcutta, to Professor Sisirkona Dhar Chowdhury, Sri Buddhadev Das Gupta, Dr. E.S. Perera (•Son—in—law of Ustad Ali Akbar Khan), Late Pandit T.L. Rana, Late Professor Arun Bhattacharya, Sri Sankar Ghosh, Sri Swapan Chowdhury, Sri Anindo Chatterjee, Prof. P. Josh and numerous other friends and well-wishers for their constant help and invaluable suggestions in shaping my thoughts and ideas, and in collecting and arranging the materials of this book. I had occasions to deliver lectures at national level Seminars organised by different Indian Universities and Research Institutions the relevant portions of which I have tried to incorporate in this book. The name of Ustad Ali Akbar Khan, the greatest Indian musician of this age, deserves special mention in this context. He had been kind enough in allowing me to participate in his informal discussions at his Calcutta residence with his friends and students and such discussions gave me many important clues enabling me to construct some of my ideas regarding the unique progressive character of Indian music. He does not know how and to what extent his casual remarks have helped me. I am indebted to Professor Nilima Sen, Adhyaksha, Sangeet Bhavana and to Professor Jayanta Chakravorty, Adhyapaka, Kala Bhavana of Visva Bharati, who have made all provisions for me to utilise the respective libraries. Professor Jayanta Chakravorty, particularly, gave me many important suggestions which I have utilised here. To Professor Biswanath Banerjee, Department of Sanskrit, Pali and Prakrit, Visva Bharati, I owe a great deal since he took great care in explaining to me many obscure passages of the texts on musicology. Regarding the views of Rabindranath and his revolutionary approach I learnt everything from Sri Santidev Ghosh, the direct disciple of Rabindranath and my language fails to express my gratitude to him. Sri Shyamal Sarkar, Head of the Department of English, Visva Bharati has helped me in numerous ways. Sri Prasanta Kumar Bhanja and Dr. Sitangsu Roy of Sangeet Bhavana, Visva Bharati, have helped me a lot by their inspiring discussions. My student, Dr. (Mrs.) Santwana Majumdar, now working at the Department of Philosophy and Religion, Visva Bharati, and Sri Gopi-krishna Das, a Ph.D, student, working under my supervision worked hard in going through the entire manuscript and suggesting important corrections for a better production. Mrs. Rekha Sengupta, an exponent of Bhajan and Nazrul-geeti, has been the main source of my inspiration in writing this book. My indebtedness to her may be taken for granted. Lastly to Mr. Shakti Malik of Abhinav Publications, New Delhi, I offer my heartiest thanks and gratitude for his kindly undertaking the bold risk in publishing this book which obviously would not satisfy any commercial interest. There is no tall claim in this book. I shall be happy if it only provokes the readers.